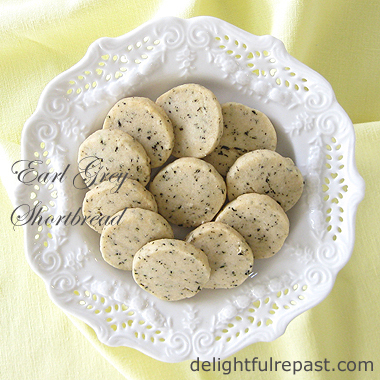 Earl Grey Shortbread combines one of my favorite teas with one of my favorite cookies/biscuits. It follows the traditional formula for the Scottish classic shortbread: 1 part sugar, 2 parts butter, 3 parts flour (by weight). The measures given, for those who prefer to measure, are just tidier approximations of the weights. My immersion blender comes with a mini processor/chopper that comes in handy for this. Just give the loose leaf tea (or the tea you've taken out of tea bags) a few whirls to make it a bit finer. If you don't have one of these or a spice grinder, you can use a mortar and pestle or your fingers; just rub the tea between thumb and forefinger. 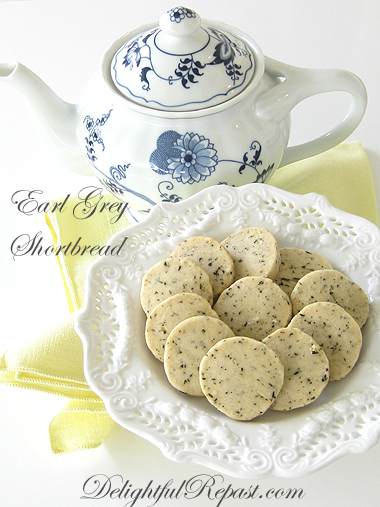 Of course, you can make these any size you like; but I like this little two-bite size for afternoon tea parties. When everything on the tea table is small, one can have at least one of everything without going completely overboard. 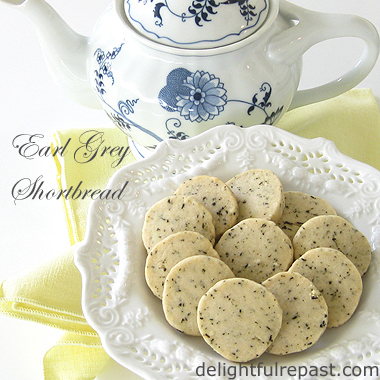 My shortbread is all organic, right down to the tea. Though I still at times drink black teas that are not organic, if I had my druthers, they would all be. Since I drink a great deal more tea than most people do, I think it's pretty important that most of it be organic. What is your favorite tea (camellia sinensis) or tisane (herbal infusion/tea)? 1 In smallish bowl, whisk together flour and ground tea. 2 In medium mixing bowl, with hand mixer or wooden spoon, cream softened butter. Add sugar, salt and vanilla extract. Cream together thoroughly. 3 Add flour mixture to creamed mixture. When thoroughly combined (it will be a bit crumbly, so knead it in the bowl with one hand), scrape out onto piece of wax paper or baking parchment and form a 10-inch log (it will lengthen to the 12-inch width of the wax paper as you roll it). Roll into a 1.25-inch diameter log 12 inches long. Place in freezer for 30 to 60 minutes. Note: Or roll it out 1/4-inch thick and cut out shapes, such as the diamonds I did with the Hildesheimer Pumpernickel Cookies. 4 Preheat oven to 350F/180C/Gas4. Slice thoroughly chilled log of dough into 1/4-inch-thick* slices and place on parchment-lined baking sheet about 1 inch apart; they only spread about 1/4 inch. (My half sheet pan handled it all in one batch.) Bake for 13 to 17 minutes until the edges are just starting to brown the slightest bit. 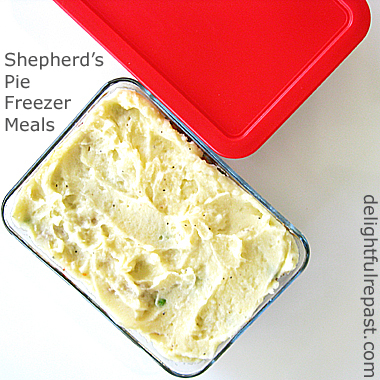 It's a wonderful feeling having a stash of homemade shepherd's pie freezer meals, and other homemade freezer meals, tucked away for those times when the cook's just not feelin' it! Oh, I do plenty of cooking (or baking) nearly every day, but not necessarily cooking that results in dinner. Know what I mean? Is it just me, or are there a lot of you out there who love to cook, just not necessarily every day? Problem is, I don't like going out for dinner every time I don't feel like cooking. And Mr. Delightful doesn't like going out to pick up takeout every time I don't feel like cooking. What does that leave? Commercial frozen food? Now, there's a grisly thought! So on a day when I am feelin' it, I like to make a huge batch of something that will feed us that evening and a few more. I'm usually cooking dinner for two and so use containers that hold the perfect amount for two. Today I made and froze two dinners for two and one dinner for four because friends who like shepherd's pie are coming in a few days. Of course, you can make this recipe in just one big 13x9x2-inch baking dish that serves 8 or in two 8x8x2-inch baking dishes that serve 4 each, but I've done the math for you in case you want to use four smaller baking dishes that serve 2 each. Other things I freeze in these meal-for-two dishes are Stuffed Cabbage Rolls and Black Bean Soup. And Spaghetti Sauce. 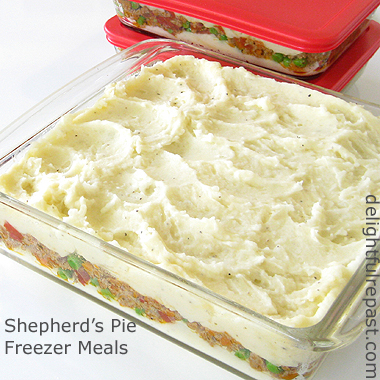 I'll also do this with my Vegetarian Shepherdless Pie. The freezer is my friend! I avoid the whole Shepherd's Pie or Cottage Pie / Lamb or Beef Controversy by making it with ground turkey. But in my family it's always been Shepherd's Pie, no matter what it's made of. And this is my big-batch version for multiple freezer meals. 1 Lightly oil or spray with cooking spray 4 3-cup (750 ml) rectangular Pyrex storage/baking dishes with lids. 2 Start the filling before the potatoes to allow plenty of time for proper browning. In 12-inch straight-sided skillet (I use the All-Clad 6-Quart Saute Pan), heat oil and cook onion and carrots about 5 minutes or until soft. Add ground turkey and brown well. Proper browning, rather than just "graying," gives the finished dish a richer flavor, making it well worth the extra time it takes. If using very lean ground meat, as I do, there is no need to drain the fat from the pan. A lot of moisture comes out of the turkey and must evaporate before any browning can occur. Note: This proper browning takes a long time, but it's worth it. Especially if you're making this for someone who thinks he doesn't like ground turkey. By the time I get through with it, people just assume it's ground beef. 3 When the ground turkey is no longer pink, start the potatoes and let the turkey continue cooking until browned. Peel the potatoes and rinse and quarter them. Put them in a 3-quart saucepan and add 1 teaspoon salt and enough cold water to cover them. Bring to a boil and simmer, loosely covered, about 20 minutes or until potatoes are tender. 4 When potatoes are halfway done, finish the meat filling. Add the Worcestershire sauce toward end of browning. When meat is browned (which can take a long time, at least 20 minutes, with lean turkey), sprinkle flour over all and mix thoroughly. Stir in diced tomatoes and seasonings and cook about 3 minutes. Add frozen peas and remove from heat. 5 When potatoes are done, drain completely, cover and set over low heat for half a minute to dry thoroughly. Remove from heat, mash, add butter and continue mashing. Stir in milk, salt, pepper and grated Cheddar. Potatoes will be a bit looser than you would make to serve as mashed potatoes; this makes spreading easier. 6 Spread 2/3 cup of the mashed potatoes evenly in each of the 4 storage/baking dishes. Spread 2 cups of the meat filling evenly in each of the 4 dishes, pressing it down firmly. Spread 1 cup of the mashed potatoes evenly over the meat filling. Cover with lids and refrigerate until chilled, and then move containers to freezer. 7 When you wish to have one of the meals for dinner, just move one from freezer to refrigerator in the morning to thaw. Preheat oven (unfortunately, these dishes are not to be used in a toaster oven) to 350F/180C/Gas4. Remove storage lid, and bake for 20 minutes (longer for larger baking dishes). Or microwave. Let stand for 5 minutes before serving. 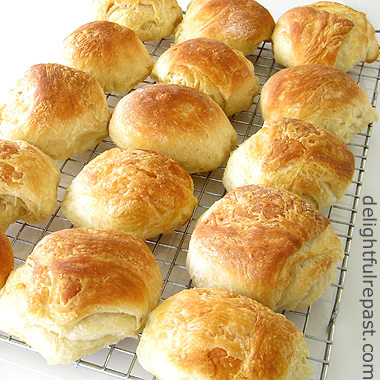 Aberdeen butteries, also known as rowies, are Scottish pastry-like bread rolls; flaky, buttery, flattened rolls that are sort of like rustic croissants. For some reason, the tradition when serving is to spread the butter (if you really think it needs more butter!) and jam (yes, please!) on the flat bottom of the buttery. But I have to tell you, I just peeked through the oven window and my butteries are not very "flattened." They are decidedly puffy! Can't wait to try one! But I might have to flatten them out a bit more next time in the interests of authenticity. Also, butteries are described as dense; and mine are instead light and airy. Aberdeen butteries are traditionally made with lard. Some people make them with half lard and half butter. And, I'm told, commercial bakers now use vegetable oil. Well, I'm not a fan of either lard or vegetable oil, so I made all-butter butteries because, as you might know, I'm a huge fan of organic unsalted butter. The shaping of the rolls isn't that crucial. They're supposed to be "rustic" in appearance so don't need to be perfectly round or perfectly anything. I did it this way (my own way! ): I took a square of dough, turned it over in my hand, folded the corners in to the center, then sort of went all around the outer edge pinching the dough up as if making a Chinese steamed bun, turned it back over and flattened it a bit. Unlike croissant dough, buttery dough doesn't need to be chilled between turns. But if you find the butter getting too melt-y at any point, just wrap the dough and pop it into the fridge for 30 minutes, as I did this time before rolling the dough out for the fourth time and for the final time. 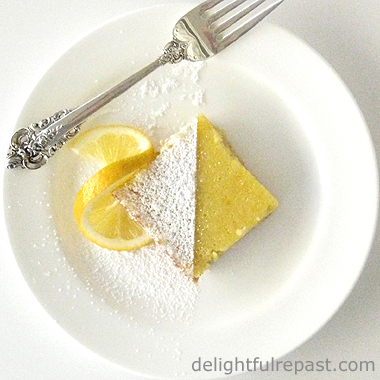 Rather than greasing the baking sheet, you flour it! This was a first for me, and I was none too sure about it, but went along. I think the idea is that the flour takes up the butter that comes out while baking. 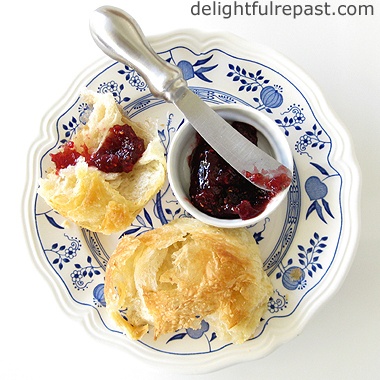 Have you ever made Aberdeen butteries/rowies? Or ever had them? Or even heard of them? 1 In medium bowl, whisk together the flour, sugar, yeast and salt. Make a well in the center, and pour the water into it, stirring to form dough. It might look like you need more water, but knead lightly with one hand, right in the bowl, to bring the dough together before adding any water. 2 Turn the dough out onto lightly floured surface and knead for about 8 minutes. Use only as much flour as you need to keep dough from sticking to the counter (I measure out 1/8 cup in advance to work from so that I'm sure to not add too much) . The dough will feel sticky, but it won't actually stick. 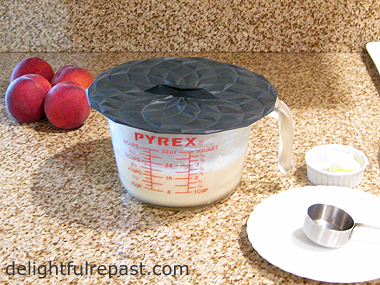 Place flattened ball of dough in a lightly oiled bowl (I use a 2-quart glass measure so I can quickly see when it has doubled) and cover loosely with lightly oiled lid or plastic wrap (no need to oil lid or plastic wrap if container is large enough that the doubled dough won't reach it). Let rise until doubled, about 1 to 1 1/2 hours. 3 Meanwhile, in a 1.5-quart bowl, cream the room temperature butter. Divide it into 4 equal portions. 4 Turn the dough out onto lightly floured surface. Press and roll it out to a 16x8-inch/40x20 cm rectangle about 1/2 inch/1 cm thick. 5 With short edge facing you, spread one portion of the butter over two-thirds of the rectangle. 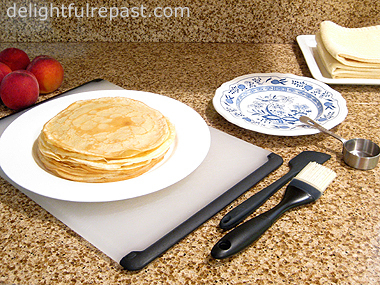 Fold the unbuttered third over the middle third, and then fold the remaining third over that. 6 Roll the dough again to the same size rectangle. Repeat the spreading and folding. Repeat two more times. 7 Roll out dough in the same way a final time. Cut the rectangle of dough into 16 equal pieces. 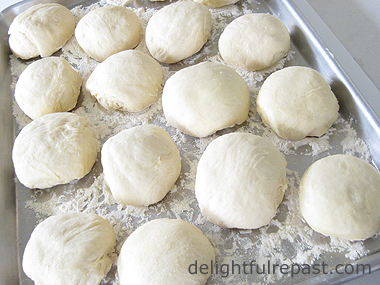 To shape the buns, take a square of dough and turn its corners under into the center, pressing down to seal, and form a round, flat bun. Place buns on a floured (I used 1/4 cup/1.25 ounces/35 grams) 18x13x1-inch half sheet pan. Let rise until doubled, about 45 minutes. 8 Preheat oven to 400F/200C/Gas6. When buns have risen, bake them for 15 to 20 minutes, or until golden brown. Cool buns on wire rack. 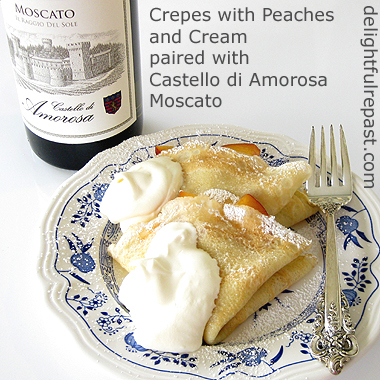 Note: They keep well stored tightly covered at room temperature for a few days, and taste good at room temperature. But if you want to regain the "shattery" crispness of the just-baked buns, reheat loosely wrapped in foil for about 8 or 10 minutes in preheated 350F/180C/Gas4 oven. 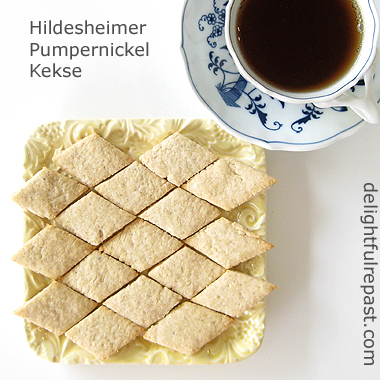 Hildesheimer Pumpernickel Cookies came to my attention in a most unexpected manner. Our friend Bill, who may well be our most uncookingest friend ever, just sent me the recipe, which he got from Brigitte, a friend of his from Hildesheim, Germany, who sends him a batch every year at the holidays. Of course, he's never actually made the recipe. Having met her while she was traveling in the US, he then visited her and her friends and family in Hildesheim. She made these cookies during his stay, and he enjoyed them and appreciated her kindness in making them, but didn't right away think they were anything to write home about. But then he found himself going back again and again for just one more. He said, "I'm not really sure what it is about them that's gotten such a hold of me, or whether this is just yet another eccentricity on my part ..." (I am a huge fan of eccentricity! ), but he eagerly awaits the annual shipment from Brigitte. And with an introduction like that, I simply had to try them. And now I know what he meant! If you like a less pale cookie, give them an egg wash before they go into the oven. Also, I think mine are paler than usual (no idea why I'm assuming that, I've not seen so much as a photo of these cookies!) because my natural foods store was out of regular almond meal so I bought the super-fine almond flour made from blanched almonds. My directions I typed out for you below use a 1.5-inch/4 cm measure for the cookies, but I actually ended up doing a 1.125-inch/3 cm measure because that happens to be the width of my 18-inch metal kitchen ruler. I think that just makes life simpler, don't you?! The recipe makes a little over 11 dozen of that size, not sure how many of the larger. 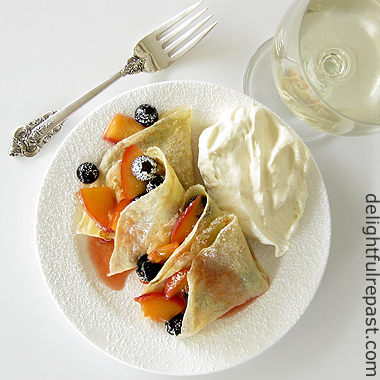 This is only my second German recipe on the blog--the first was Golumpkis. So I didn't know whether to call them cookies, as in the US, or biscuits, as in the UK; so I Googled it and came up with "kekse." If that is incorrect, do let me know. (Whenever I do a translation on the internet, I always worry that it's going to turn out to be something obscene!) And let me know if you've ever heard of this crunchy little cookie. I love your comments. Guten Appetit! * For gluten-free: use 3/4 cup sorghum flour, 3/4 cup potato starch, 1/2 cup tapioca flour, 1/2 teaspoon xanthan gum in place of flour. 1 In small bowl, whisk together flour (or gluten-free ingredients above), baking powder, spices and salt. 2 With electric mixer, cream butter well. Add sugar; continue creaming. Beat in egg until well mixed. 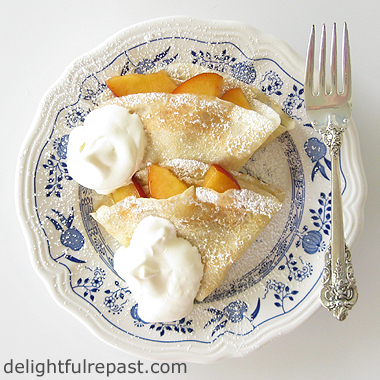 Beat in almond and/or hazelnut meal, then beat in flour. If dough is too dry, mix in a little water just a teaspoon at a time. Scrape out onto piece of waxed paper or plastic wrap, shape into a rectangle about 5x7 inches/13x18 cm, wrap and chill for about 30 minutes. Note: Even when the dough is "right," it won't be a cohesive dough without using your hand; so don't be too quick to add water. Squeeze it with your hand to see when it will hold together. My dough was quite dry, so I added water a tablespoon at a time, working the dough with my hand, and ultimately added 4 tablespoons (1/4 cup/2 fluid ounces/59 ml). The dough should be quite stiff and leave a clean bowl. 3 Preheat oven to 350F/180C/Gas4. 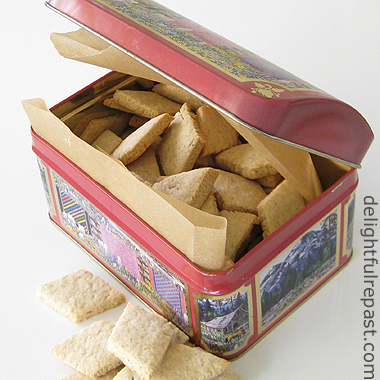 On very lightly floured piece of parchment paper, roll dough into 1/8- to 3/16-inch/3 to 4 mm thick rectangle, about 10x18-inch/19x30 cm (trimmed; you will re-roll trimmings). Cut into 1.5-inch/4 cm wide strips, then cut across strips diagonally (the same 1.5-inch/4 cm spacing) to form diamonds (our eccentric friend called them "parallelograms"). With a small offset spatula, lift the cookies onto a parchment-lined baking sheet, spacing them about half an inch apart. Bake for about 15 minutes; edges will be just barely starting to brown. Note: If the dough is too warm and you're having difficulty getting the diamonds onto the baking sheet, chill the whole thing for a few minutes. Leaving the cut dough on its parchment, place it on a baking sheet and pop it into the freezer for 5 minutes before transferring the cookies to a parchment-lined baking sheet. If desired, brush top of cookies with a "wash" of beaten egg yolk; I didn't.